We defy any girl with a love of boho fashion not to instantly adore these beautiful kimono dresses. With flattering wrap shapes and effortlessly draped fabric, they’re ideal for achieving that chic yet laid back, effortless look. Shop our edit of showstopping styles and varying prints to find that carefree look you’ve always dreamed of. We love to wear florals all year round and kimono dresses are the perfect way to do so. These beautiful frocks will have you feeling effortlessly chic the moment you put them on! 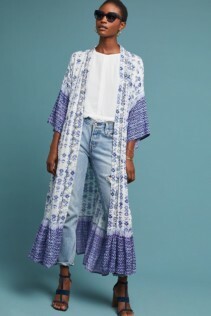 The Mel duster kimono dress by Muche Et Muchette, for example, is not only beautifully but wonderfully versatile. Use it to style up a more casual ensemble and give it a laid back bohemian finish. This beautifully printed viscose piece is ideal for adding a touch of colour and charm to a look with more neutral tones. 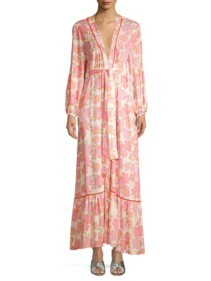 Get a complete look with the floral printed silk kaftan dress by ETRO. This brand draws evidently on their Italian roots with this stunning silk creation. It is retro in nature owing to its charming floral print in a soft, neutral palette. A considerably more modern injection comes from the dropped shoulders and cropped sleeves. We also adore the flattering V-neckline and front split in the midi length skirt. 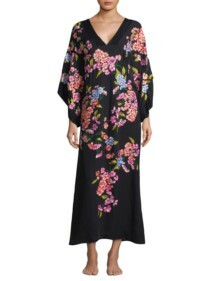 For your next evening out, forget about LBD’s and evening gowns and give kimono dresses a try. It may not be a style you’ve often considered but after you see these stunning gowns you’ll certainly wonder why. 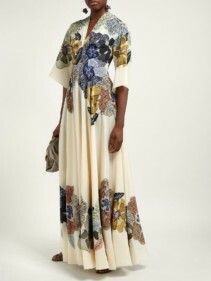 For an unquestionably classic look, opt for the embroidered ivory satin wrap dress by Osman. Delicate peach undertones give this glamorous dress a hint of warmth without stealing away from its polished construction. You’re certain to fall in love with the charming gold embroidery on the cropped balloon sleeves too. The wrap style and low V-neckline are incredibly flattering to whoever chooses this elegant dress. 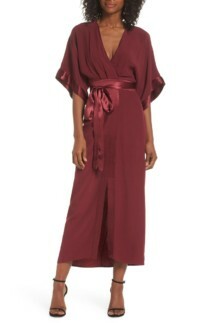 If your evening calls for a dress with drama, try the Rey velvet kimono dress by Nili Lotan. Sumptuous black velvet defines this truly impact-full yet minimal dress. It slips on yet ensures to compliment and shape your figure with the self-tie belt. Style this dress with black accessories to complement its simplicity or opt for brighter hues to add an individual touch.